If you are installing ceramic tile over another surface, it is important to follow specific recommendations and steps to make sure there will be proper bonding. Ceramic tile over wood, tile, concrete, or vinyl should be installed by using appropriate products that will allow the right adhesion between surfaces. Always be sure the existing surface has been cleaned and leveled. Installing ceramic tile over concrete requires repairing all cracks and voids in the concrete prior to the installation process. Cracks in the concrete eventually will lead to cracks in the tile because the concrete at the point of the crack won't be able to support the tile. For cracks, less than 1/8 inch, use crack suppression products. If installing over larger cracks, you must consider removing the concrete section and pouring a new concrete slab. If you are concerned about cracks, you may want to have an isolation system installed onto the slab to separate/detach the tile from the slab. This is a membrane that separates the tile from direct contact with the concrete, helping to provide support for any weaknesses in the concrete due to shrinkage or expansion. It also is important to verify that there are no chemical products acting over the concrete surface. Some chemical products applied over the concrete surface can reduce the bonding capacity of the tile over the surface. To check the slab for the presence of such a coating, drip a few drops of water on its surface. If the water beads, it's highly likely that a coating was applied. To install ceramic tile over wood, the wood surface must be structurally sound enough to support the weight of the tile. Chipboard, cushioned vinyl flooring, particle boards of any type, oriented strand board (OSB), interior-grade plywood, tongue and groove planking, and hardwood floors are unsuitable substrates for direct installation of ceramic tile. Tile is hard and will break or dislodge if the surface bends under the load, and many wood surfaces can expand or contract, negatively impacting their ability to stay level and support the weight. If you must install over such surfaces, it is best to install a backer board over the old surface and install the tile on the backer board. If installing over an appropriate wood surface, sand the wood to make it smoother, and remember that the installation will work better over a subfloor at least 1-1/8 inches thick. If the tile is being installed in a bathroom, consider applying an isolation membrane over your wood subfloor to further protect against expansion and contraction. Before installing ceramic tile over the existing tile you will need to roughen the existing ceramic tile surface to produce a better grip for the new ceramic tile. It is recommended to sand the floor using 80-grit sandpaper. After the tile has been sanded, clean and remove all particles and dust before applying a floor leveler product to fill in grout lines and level the surface completely for the new tile application. Use a thin-set product to install ceramic tile over existing tiles. This is a mixture of cement, fine-grain sand, and water that will adhere the new tile to the old. When it comes to mortar, latex or epoxy options are best for installing tile over tile. Also, consider that doors, cabinets, and other hardware might need to be reworked or replaced with new ones to compensate for the higher floor. Installing ceramic tile over vinyl or linoleum surfaces can be more complicated than expected and probably should be avoided whenever possible. However, if you can't remove the old surface or otherwise decide to install over it, lay a backer board with thin-set over the old surface to serve as your new subfloor material. It is important to use the thin-set recommended by the backer board manufacturer, make sure all loose adhesive is removed from the surface, and verify that a good bond to the substrate can be achieved. For cutback adhesive residue, verify that the thin-set manufacturer's mortar is compatible. 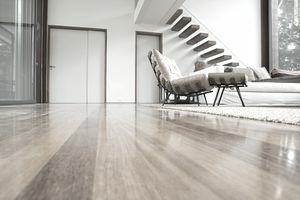 It's not uncommon for subfloors to develop low spots or other imperfections over time, but before installing a new floor over one, it's very important to address these issues and make certain the subfloor is level. Low spots can be filled in with a floor-patching mixture that then can be sanded once it has hardened. When actually laying the tile, measure out an area away from walls and other border areas where you can install full squares of tile. Once you have allowed this to set and can walk on it, measure the space you have along walls and other border areas, minus the grout line, and mark where tiles need to be cut to fill these odd spaces.